It seems President Kuczynski is to lay the First Stone of the new Chinchero Airport in Cusco this coming week. If so, it will be the third first stone for this sad project. Presidents Toledo and Garcia have preceded him. Some locals say Presidents Belaunde and Fujimori were others. We have to hope President PPK’s stone suffers the same fate. Chinchero is a disaster waiting to happen. This week top regulatory officials in Lima resigned in protest at the illegal contracts for the financing for Chinchero. But crooked finance contracts are the least of of what has always been a rotten project. The Cusco city fathers say they need a new airport. This is incorrect. Their object is to grab the valuable building land of the present airport. But even if Cusco needs a new airport, Chinchero is easily the worst of the alternatives. The Pampa de Anta, nearby, is incomparably better. Anta is dramatically lower in height and is already runway flat. Chinchero is outside Cusco at an oxygen-less 500ms higher, on the road to Machu Picchu. It started off, as these projects do, with funny money. Four years ago the Cusco Regional Government, run then by ‘Humala associate Jorge Coco’ Acurio, paid $70 million for a 330-hectare string of potato fields on the rolling, cold, cloudy massif of Chinchero. The lucky owners of the fields were the 426 members of a couple of Chinchero’s comunidades. They received $230,000 for each hectare, making them by far the most expensive potato fields in the world. You can buy a hectare of potato field in Idaho, the world’s biggest potato region, for $5,000 per hectare. In expensive southern England, in Devon and Somerset for instance, the same potato field might cost GBP 10,000, one-twentieth of the Acurio Chinchero price. The Chinchero potato fields are good for potatoes, beans, a couple of sheep and a burro. They make a lousy airport. Difficult in fact to find a worse location. The average height of this ancient farmland is 3,700 m.a.s.l. The only commercial airport in the world that is higher is El Alto, at 4,000 m.a.s.l., the airport for La Paz. El Alto can be used only for local one-hour , max 90-minute hops down to Cochabamba and Tarija and Santa Cruz. Arica is a ski-jump away, Lima a hop up the coast. But that’s it. El Alto never will be commercial because planes cannot take off at these altitudes with a full load of fuel and passengers. You can have either a full tank and just a few tourists or lots of tourists and a few gallons of fuel, enough to get down the hill. In the case of Chinchero, that means Lima. As Newton said, apples fall down for free. Bolivia’s international airport is at Santa Cruz at 400 m.a.s.l. Passengers to and from La Paz to Rio, Buenos Aires, Miami and even Lima go via Santa Cruz. Check the timetables. It will be the same for Chinchero. The bureaucrats and politicians in Cusco and in Lima, at ProInversion and the Ministry of Transport, have taken to calling it the ‘International’ Cusco airport. This is a lie propagated by the under-funded concessionaire, Kunturwasi. Flights between Chinchero, if this idiot, foggy project goes ahead, will continue to go via Lima, as they do today and till the next century. With one difference. The tickets will cost $300 more than they do today. Fog, hailstorms, normal in high mountains, add to the Chinchero danger. The glaciers and snowfields of the Cordillera Urubamba, at 6,000 m.a.s.l., loom over Chinchero. They are just a few miles to the north of the Chinchero potato fields. Picturesque, dramatic. Dangerous. Technological advances in aviation are focused on electronics and nano materials. But Newtonian physics will not change, whatever the Cusqueño powerbrokers seem to think. It could not get worse? Yes, it does. The Chinchero massif is a limestone base. For engineers, this means sinkholes. For instance, the Inca terraces at Moray close to Chinchero at the same height, are sinkholes. The Chinchero lakes of Piuray and Huaypo reflect the same geology. Engineering studies reflect no deep drilling to assess this risk. A 200-ton airliner will one day land at Chinchero and open a massive instant hole. Not good. Cusco road, sewage and electricity services are already pathetic. There’s talk, but no plans exist for new transport between Chinchero and Cuzco, nor Urubamba. Power cuts are almost daily in Urubamba, the province in which poor Chinchero is located, thanks to state-owned Electro Sur Este. What to do with the 7 million tourists a year promised by President Kuczynski? Machu Picchu is already at a standing-room-only 5,000, sometimes 7,000 visitors a day. A study commissioned by the government says the max daily entry cannot pass 5,400/day. Call it 2 million per year. Cuzco thinks, says, it needs a new airport. The present one, Velasco Astete is at 3,250 m.a.s.l., 500ms lower than Chinchero, which is a big difference at these delicate heights. Velasco Astete, run and owned by Corpac, the government airport authority, consists of 240 hectares of good flat land which could easily and cheaply have its runways extended and expanded, with new terminals and, above all, new electronics. The A219 and A320 used by Latam and Avianca can fly in on self-drive computers as they do routinely, of course, in Europe and North America where the weather, though for sure not the height, is much worse than Cusco ever is. But the Cusco shakers, the chambers of commerce and the local politicos have other plans for Velasco Astete’s 240 hectares of land, which is only a few minutes from downtown. As building land it is worth already today $1,000/m2, $2,000/m2 before the end of the decade. Use your own fingers to work out how much this free gift of land will be worth to the imperial city’s top dogs. In theory, the central government (all Peruvians) is owner of the land, and indeed this is how it should be. But, no, the Cusqueños have already bought it. Under a quiet agreement with former President Humala, the $70mn it paid the Chinchero comuneros is being handed over to the central government in exchange for the 240 Corpac hectares of Velasco Astete. Acurio was later thrown out of the regional president job by the Cusco Supreme Court for one of several instances of corruption. Acurio is one of the Humala-Heredia team being investigated by state prosecutors for corruption linked to the jailed Mr. Belaunde Lossio for thousands of millions of dollars in state construction contracts. So Chinchero is shrouded in big money corruption, and should be stopped, investigated on these grounds alone. This apart from its technical stupidity, a characteristic of corrupt projects. There is a good way for the Cuqueños to have their cake and eat it too. They can do the sensible thing and build a new airport on the Pampa de Anta, closer than Chinchero to their downtown and flat as a tortilla. It needs a few million bucks worth of drainage but none of the expensive earthmoving of Chinchero. Its approaches are no more dangerous than Cusco itself, better actually. What height is Anta? Same as Velasco Astete, 3,225. What is the Region Cusco to do with its world-record expensive potato fields, burro grazing at Chinchero? Forget it. The money has long gone on pick-up trucks and on a forest of dreadful cinderblock highrises. Chinchero is a traditional Andean village with a fine cultural tradition in textiles, with superb views of the cordilleras reaching over to Machu Picchu. Leave it as it is. No airport means tourists will retain as fine a view as any in the Andes. The bells of the charming colonial church will continue to float out over the Inca ruins, the primary schools and the workshops of the internationally recognized weavers. Nick Asheshov was editor of the Andean Air Mail & Peruvian Times during the 1970s and 1980s, and of The South Pacific Mail, Santiago during the 1990s. He was Latin America Editor of Institutional Investor, New York over the same period. 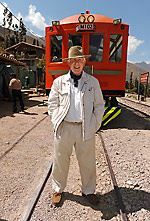 He lives in Urubamba, where he writes a blog and where he has been prominent in the hotel and railway business.